Release Date: August 15th, 2007 (Two Boots Pioneer Theater) by Media Blasters. The Cast: Yui Ichikawa, Kyoka Suzuki, Sho Aikawa, Teruyoshi Uchimura, Koen Kond. 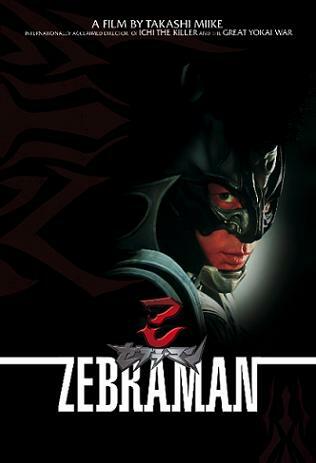 BASIC PREMISE: Shinichi (Aikawa), a schoolteacher, turns into Zebraman, a superhero from a cancelled TV show, and must use his powers to save the planet from evil aliens. ENTERTAINMENT VALUE: In the refreshingly wild and whacky Zebraman, Sho Aikawa plays Shinichi, a schoolteacher who goes through a bizarre midlife crisis which involves him dressing up as the superhero Zebraman, a TV show cancelled in 1978 after just 7 episodes. His wife cheats on him and at school his students and colleagues make him feel worse, so, to escape all that, he walks around in a Zebraman costume. Only a new student in a wheelchair, Asano, understands his obsession with Zebraman. In a brief, underdeveloped subplot, Shinichi and Asano’s mother flirt with each other. He has more large-scale tasks to do than to flirt with her, though, especially when aliens possess another superhero, Crabman, and threaten to destroy the planet while possessing other humans. Screenwriter Kankurô Kudô combines offbeat comedy with lively action, a little drama, and even a few interesting plot twists later in the second act. Those expecting lots of gore and disturbing scenes, like in other Takashi Miike films, will be surprised how Miike replaces it all replaced with outrageous visuals that are easier on the eyes, for a change, along with nifty CGI effects during the action sequences. Unlike the recent, dull remake of Invasion of the Body Snatchers with Nicole Kidman which also happens to involve aliens taking over humans, Zebraman actually has plenty of surprises and an imaginative plot that, fortunately, never takes itself too seriously. IN A NUTSHELL: A refreshingly wild, whacky and imaginative ride.